I’ve never met a blueberry muffin I didn’t like. After all, blueberry muffins are the closest I’ll let myself get to eating cupcakes for breakfast (and I can even say I ate some fruit). 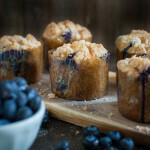 My favorite blueberry muffins always seem to have streusel topping – the more streusel the better. It’s like having cookies on top of my breakfast “cupcake”. I’ll admit that I’ve had several favorite blueberry muffin recipes over the last few years but I consider blueberry muffin recipes to be like chocolate cake recipes. Even when I’ve got a recipe I like, I’m always trying new ones to see if I can find one that’s better. This recipe for streusel blueberry muffins has been my favorite for the last couple of years, so I thought it was time to share it. Creaming the butter and sugar together as well as the addition of sour cream in the batter give the muffins a cake-like texture with a tender crumb. Each muffin gets a very generous serving of crumb topping that bakes on top and also works its way into the muffin doubling your streusel joy. A few years ago, I discovered paper muffin molds and I haven’t used a muffin pan for baking muffins since. The paper molds let me bake muffins in any quantity I want without being limited by the number of muffin pans I have. They also take up a lot less room than traditional muffin pans (if storage space is an issue for you) and they are just plain pretty. You simply put the self-standing paper molds on a rimmed baking sheet leaving enough room around each one to allow for even air flow. I order mine from Amazon but I’ve also seen them at baking supply stores. Note that the recipe only makes six muffins (at least for the size muffin molds I use). In most cases, six muffins is just enough for our family of four. The molds I use are 2 3/4 inches in diameter x 2 inches high which is big enough for everyone to have a muffin at breakfast leaving us with one or two muffins left over for snacking on later. If you want more leftovers, the recipe easily doubles. In a small bowl, whisk together the flour, sugar, and cinnamon. Add the butter. Using your fingers or a pastry cutter, work the butter into the dry ingredients until the mixture resembles coarse crumbs. Set aside. Heat oven to 350 degrees F. Place 6 paper muffin molds on a rimmed baking sheet. In the bowl of an electric mixer fitted with the paddle attachment, cream the butter, sugar, and vanilla together until light and fluffy, about 5 minutes, scraping down the sides of the bowl about half way through. Add the egg and blend until combined. In a separate bowl, whisk together the flour, baking powder, and baking soda. Add half of the sour cream to the butter-sugar mixture and mix until combined. Then add half of the dry ingredients and mix again. Repeat with the remaining sour cream and dry ingredients until the batter is combined. Fold in the blueberries with a spatula until the batter is evenly mixed. Scoop the batter into the muffin molds, filling each cup about halfway. Top each muffin with streusel topping evenly dividing the topping among the muffins. Bake for 25 to 30 minutes, until the muffins are lightly browned on top and a cake tester comes out clean. Cool muffins for 10 minutes before serving. For the streusel topping, you can also use a food processor to cut the butter into the dry ingredients. I find that the food processor can make the crumbs too fine so be careful not to over-pulse as you want some larger pieces of crumbs. I use paper muffin molds that are 2 3/4 inches in diameter x 2 inches high. Recipe adapted from the Clinton St. Baking Company cookbook.